Starting later than most other European countries, England began settling along the east coast of North America. Some people arrived searching for religious freedom, some for profit, some because they had no where else to go. Quickly, the population grew and the English colonies expanded. Soon, conflict over territory erupted between Britain and France resulting in the French and Indian War--the first war to be fought on a global scale. After nine years of fighting, Britain tossed the French out of North America but now had to scramble to pay off the crushing debt from the war. Britain turned to its colonies for help by imposing one tax after another. The once peaceful thirteen colonies that could never agree on anything, began to unite in their opposition to British rule. After the French and Indian War 1756-1763 (a.k.a. The Seven Years' War) Britain had dramatically increased its holdings in North America. Unfortunately, the war also left Britain with a debt that could no longer just be paid by the landowners in Britain. In addition, Britain also had to keep control over its new territories in America with more soldiers and administrators—all of which meant spending more money. The British government reasoned that the thirteen British colonies that paid very little in taxes should help finance the peace. Britain began passing a series of taxes that more than irritated the colonists who, up to this time, had been doing very well without the mother country interfering in its internal affairs. Each new tax was met with resistance until both sides refused to compromise further. Violence escalated until war became inevitable. 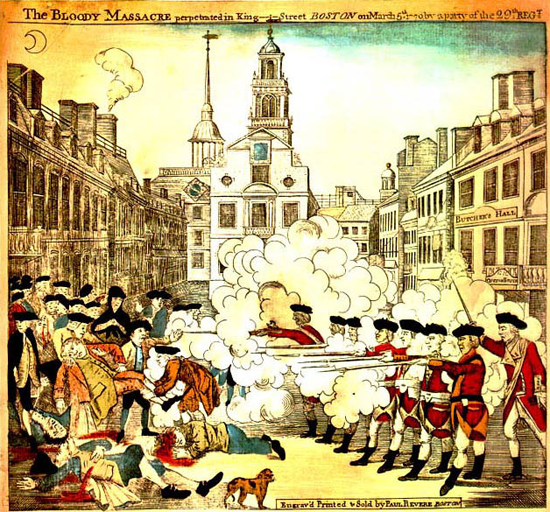 The Boston Massacre took place on March 5, 1770. This engraving by silversmith Paul Revere depicted the British soldiers deliberately firing on an unarmed crowd. This piece of propaganda worked well to inflame anti-British feelings in the colonies. Click on a link below to bring up the .pdf file containing most of the notebook and textbook worksheets that will be used in this chapter. You may print some or all of the given pages. These are worksheets used for all U.S. History classes. Since most of these activities are cut out and pasted into the notebook, print using only one side of the paper. These are worksheets used outside of the textbook for various activities. One copy of each sheet will be provided to the student at the appropriate time. These are sheets that contain information for students to use to complete specific assignments.